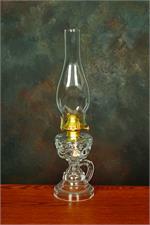 The Grand Double Wick Oil Lamp olluminates brightly, providing more than twice the light of one standard wick. Attractive, fanned-out base with 12-sided font. Stunning pedestal shaped font, made of art glass with an intricate, slender design. Comes with a solid brass Number 2 Queen Anne flat wick oil burner. 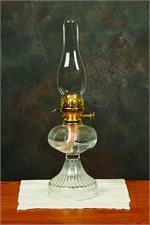 An elegant clear glass oil lamp, with decorated pedestal shape. Comes with a number 3 solid brass Queen Anne flat wick oil burner. Complete lamp, just add fuel.